Iatrogenic derives from the Greek words iatros, meaning physician, and genein which means to produce, and may be defined as any adverse condition in a patient induced unintentionally by a medical professional. For the doctor concerned, this can be a significant setback, particularly if the treatment leads to the death of a patient. The aphorism “First, do no harm” – from the Latin primum non nocere – is one of the guiding principles for doctors, and something they are taught to take seriously. Familiarity with the latest scientific findings is one crucial approach to ensure that inadvertent mistakes are avoided. It is well known that breast cancer is among the most common types of tumour, and that metastasis – the spread of malignant cells away from the primary site in the breast – greatly increases the risk of death. 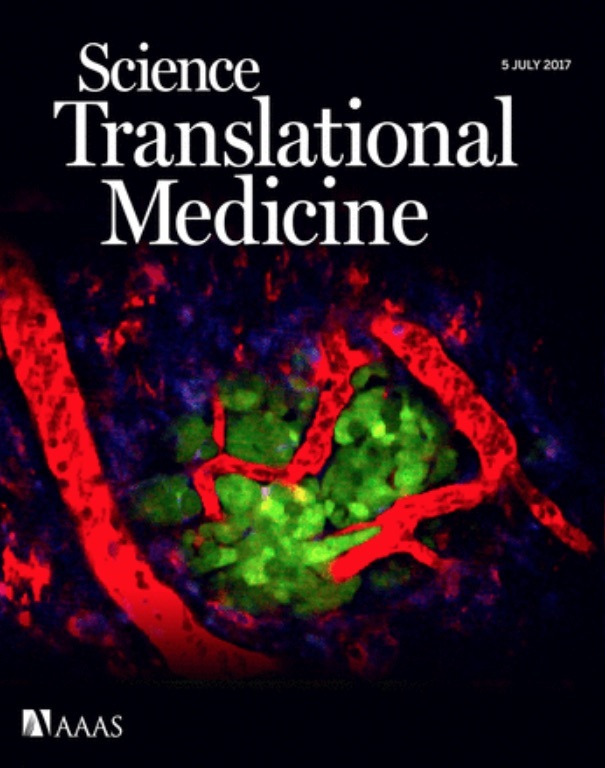 Researchers from Albert Einstein College of Medicine in New York have just published an important paper in Science Translational Medicine in which they studied how cells enter the vasculature. Karagiannis and colleagues discovered that, in addition to killing tumour cells, some types of chemotherapy treatment can also lead to an increase in cells entering the bloodstream. They studied groups of cells known as tumour microenvironment of metatastasis (TMEM) and demonstrated these can serve as gateways for cell movement. The images seen below left (© AAAS) depict a tumour in a mouse model of breast cancer that has been treated with paclitaxel, where tumour cells are green, macrophages are blue, and blood vessels are red. The arrowheads indicate a region of “bursting” where blood vessel integrity has been disrupted in the TMEM structure, facilitating the entry of tumour cells into the vasculature. Neoadjuvent chemotherapy, such as the administration of paclitaxel, is often given to breast cancer patients before surgery so as to shrink the size of the tumour, but the researchers showed such chemotherapy could also increase the risk of metatstatic dissemination. Karagiannis suggested: “One approach would be to obtain a small amount of tumour tissue after a few doses of pre-operative chemotherapy. If the marker scores are increased we would recommend discontinuing chemo and having surgery first, followed by post-operative chemo.” Interestingly, the researchers also discovered that the drug rebastinib could interfere with TMEM activity and thereby reduce the risk of cancer cells entering the bloodstream. Although this research may be considered controversial – perhaps even counter-intuitive – it illustrates the beauty of good science: we can always learn something positive. For doctors endeavouring to avoid a dangerous outburst, it behoves them to read the literature! thanks for a great article. We manufacture a range of Paclitaxel infusion administration sets here in Cape Town which we supply to both private and public hospitals/clinics but there seems to be some confusion around whether the iv tubing should opaque or not. Is Taxol a light sensitive drug? Do you know or can you suggest any white papers on the subject? Always enjoy reading your Blogs! Hear Ye Hear ye! Investing in Cape Ray is investing in women’s lives, irreplaceable women’s lives, priceless lives, not just the bottom line.